I told him to send you yourcertified bank check of $150.000.00 which I prepared and kept for your compensation for all efforts and attempts to assist me in this matter. I appreciate your efforts at that time very much.so feel free to contact the Rev Father and instruct him where to send you the money. Please let me know immediately you receive it so that we can share our joy after all the sufferings at that time. At this point, I'm very busy here because of my studies and I SORM project and the investor has at hand, finally, remember that I had forwarded instruction to the Rev Father on your behalf to receive that money. So do not hesitate to contact him and he will send the amount to you without any delay,and please do not forget to inform me as soon as the money received. Darling, you are the type of person i am looking forward to spend the rest of my life with. Note I am not going to give your love to another man, Please i have not told anyone except you about the existence of this money and i will like you to please keep it secret to other people because since it is (MONEY) all eyes will be on it. I confide you dear that's why i am giving you all this information. My love is for you and only you alone. i see you as a good man that is why i come to you and i know you will not disappoint me. No.36 St Andrews Square Edinburgh, UNITED KINGDOM. Subject: Miss Brenda brenda_des@hotmail.com has leftleft with me a check of $150.000 in your name. I am Rev Father Luke Barnabas the coordinator and controller of the Refugee camp here in Senegal. has left to united kingdom and she left with me a check of $150.000.00 us Dollars with the bearers name. So therefore to be sure that the check belongs to you, Kindly send me your full name and contact address so that after confirmation, i will send you the Cheque through DHL POST. Age:. . . . . . . . . . . . . . Gender:. . . . . . . . . . Occupation:. . . . . . Address:. . . . . . . . . I shall wait for your response as soon as you receive this mail today. have to follow all the Instructions on this. my son. I was unable to complete this as a result of non-availability of your information's at hand.So you are required to send your full informations to effect this post. FULL NAME:. . . . . .
FULL CONTACT ADDRESS:. . . . . . MOBILE PHONE:. . . . . . . .
BANK INFORMATIONS. . . . . . Try to contact the Western Union today with this E-mail. As soon as this information is received by the WESTERN UNION AGENT, the money will be sent to you via Western Union or from The Western Union Transferring Bank. which we received earlier. We are hereby acknowledging the receipt of your application as an appointed next of kin to our deceased customer Dr. Patrick Bokari. In line with our security measures and allied administrative matters, your application is going under secularization by the executive management board of this bankand this will be approved upon the fulfillment of our official obligation after certifying our bank the following questionnaire. 1) A power of attorney permitting you to claim and transfer the funds, to your bank account on her behalf; from Senegalese high court. 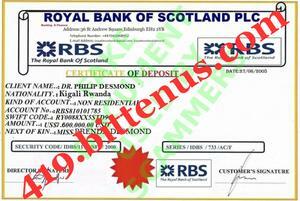 2) The deposit certificate of the fund. 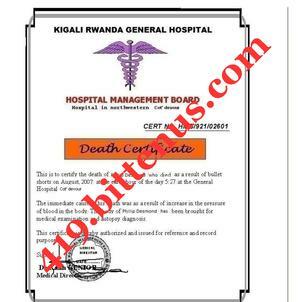 3) The Death certificate of the late father. This Power of attorney and affidavit oath of support must be endorsed by a Senegalese lawyer. (Since the money is originated from Africa and the young lady is currently residing in Senegal)The above four document are compulsory, and are needed to protect our interest, yours and the next of kin after the transfer has been made. These shall also ensure that a smooth, quick, and successful transfer of the fund is made within 48 hrs from when our bank receives the above mention documents. Should you have any question(s) please contact our Chairman Executive Operational/Director of Finance Officer Mr. Philip Hampton. through his telephone number for more clarifications and directives.We promise to give our customers the best services. How are you today ? hope fine. Nice to hear fromthe bank.I want to be sure of the documents needed by the Bank before getting back to you.However,Thanks for your ability to help me transfer the money to your position pending my arrival to meet with you,it shows you are a dependable and trustworthy man. May you be blessed and happy in life.Listen before I gave you this information s I saw your profile that you matched mine. Please remember to keep my secret. So I will also advise you to please keep it to your self because I am afraid of loosing the money to people who will disappoint me when the money gets to there care that was why it took me time to tell you about it and I promise you this from my heart (I AM NOT GOING TO DISAPPOINT YOU) and I equally expect the same from you. Like i have told you before that presently i have my late fathers death certificate and statement of account which i have attached the scan copies . (which I wills give to the lawyer when he agrees to help us)and the death certificate, which I will also give him, so he can send them to you. So, I will like you to contact him for the preparation of the power of attorney. Please try and contact me when you are in contact with him and let me know if he agrees to help us!. Please I will like you to first of all get the money transferred and from it you can send some money for me to prepare my documents and when you come here we can move at the same time. Thanks again as I think of you always.